Data security is important when you are dealing with the Internet and mobile applications. 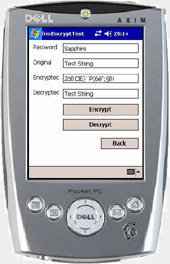 Having confidential information stored on your Pocket PC means you need to ensure that it is kept save if the device gets stolen or if you are transferring it over the internet. Consider the situation if a company’s client list getting into the hands of a competitor! Implementation couldn’t be easier, simply declare the DLL function as a function within your application and call it as though you wrote it yourself. Here’s a sample demo on how to encrypt and decrypt a simple text string within VB.NET.